Replacing the hard drive on your laptop or desktop computer is one of the best upgrades you can make; in particular, it will help you prolong the useful life of an aging laptop. Upgrading to a larger drive gives you much-needed additional storage space. You also can gain a big productivity boost from faster hard drive speeds, especially if you're going for a solid-state drive (SSD); the prices of these have dropped dramatically in recent years, making them good investments in speed and reliability. 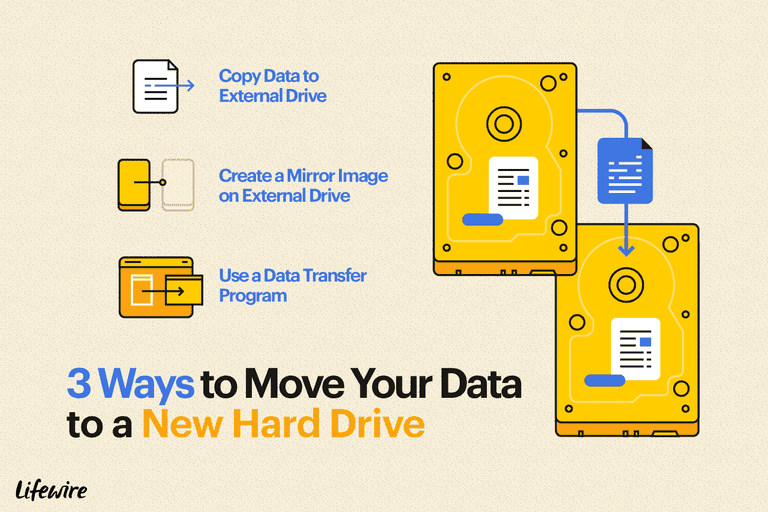 Here's what you need to know about replacing your hard drive and easily moving your data and programs to the new one. Not all hard drives are the same. If you have an older laptop, for example, the connector for the drive might not work with newer hard drives. Similarly, make sure the drive you buy will fit properly into your laptop or desktop PC bay. To find out the specifics on what kind of drive you should buy, do a web search for your current drive manufacturer and model to get the size, thickness, and interface (e.g., 2.5-inch, 12.5mm thick SATA drive). Most laptops use 2.5-inch drives, but do check yours to make sure; you'll find the info on the drive label itself. Once you've purchased the right drive replacement, physically swapping your old drive with the new one is very easy — just a matter of removing a few screws and sliding in the new drive in place of the old one. If you have an external hard drive lying around or network-attached storage (NAS) device, you don't need to buy anything besides the new hard drive. Using software such as Acronis True Image or free Clonezilla, you can save an image of your current drive onto your existing external drive. This copies or mirrors the drive completely with data, applications, and settings intact. Then, you can physically swap out the old drive in your computer with the new drive, run the cloning software again on the new drive, and install the cloned image you saved from that external drive or NAS. Find the Start menu on the laptop. In the search box, type Windows Easy Transfer. Select An External Hard Disk or USB Flash Drive as your target drive. For This Is My New Computer, select No, then click to install to your external hard drive. Windows will copy your data and settings to the external drive. The method above, as you can see, entails the extra step of copying your drive to an external (intermediate) drive, then back to the new drive. If you don't want to use an intermediate external hard drive or NAS to copy the data back and forth, you can just connect the new and old drives together using either a simple USB-to-SATA/IDE adapter or cable, a laptop hard drive enclosure (which holds the old hard drive and connects it to your laptop via USB), or a laptop hard drive upgrade kit. The latter typically includes not just the enclosure and cable but also software for cloning the old drive to the new one. In this case, you have two options: cloning the old drive, and copying just the data. Connect the new drive to the laptop with the cable. Then, use the cloning software to clone the old drive onto the new one. Finally, swap out the old drive with the new drive. Install the new drive into the laptop. Install Windows and your other applications fresh onto the new drive. The preferred method is to swap out the new and old drives, then connect the old drive to the laptop via a USB adapter cable. Then, just copy the folders under Users to the new drive, after installing Windows and the apps fresh. It takes more time to install the operating system and programs again, but you wind up with a brand-new system. Programs such as Ninite and AllMyApps make reinstalling applications very easy when setting up your new laptop or setting up your laptop with your new hard drive.